In addition to this I’ve also written on how to reset a .lnk file type association, this is when you/someone/some application accidentally (or intentionally) associates the .lnk extension with notepad (or some other program) this causes all shortcuts on your desktop and start menu to open notepad with absurd characters. 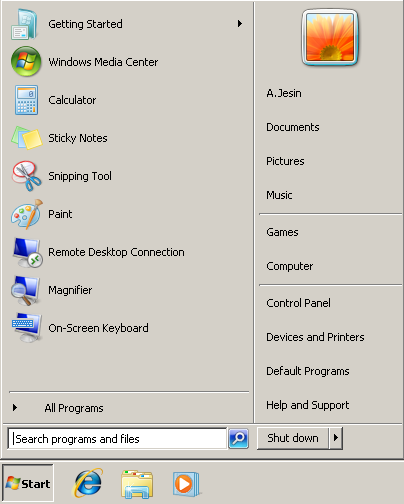 Go to Start menu > Run or press [windows] + R and enter regedit. Before doing anything else take a backup of the registry by going to File menu > Export, enter a file name, choose a location and save. If you encounter problems in the future you can restore this file by going to File menu > Import and selecting the file. Right-click and choose to delete the key and click yes to confirm it. Right-click and delete this key too. 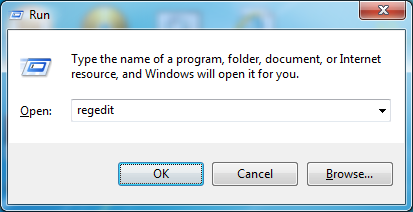 Now when you try to open a file with a .html extension you’ll get the following window asking you to choose a program to open this file. You might notice at this point that the thumbnails of .html files still show the icon of the previous program they were associated with, this will disappear once you logout of windows and login. 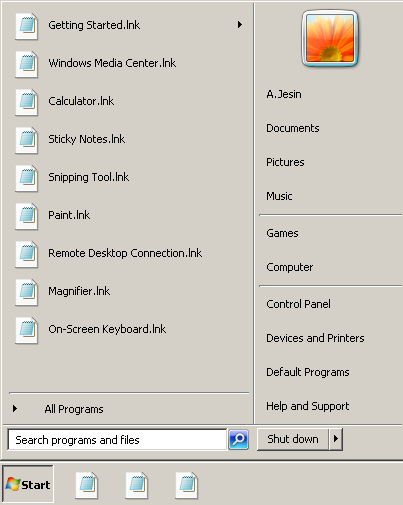 One day when you login to your computer and open the start menu you see something similar below. Every shortcut on your desktop now looks like a text file and double clicking it opens notepad with some weird characters. This can very easily be solved by removing the .lnk association and associating lnk to “lnkfile” with a command. The first letter in the extension “lnk” is a small “L” (l for link) and NOT a capital “i” (I for India) so be careful about this. All shortcut files will now be restored to their original icons and you’ll be able to open them normally. This is how my start menu looks now after I reset the .lnk file association. I’d love to hear if it worked for you, do drop a comment below. created a dummy .exe file. 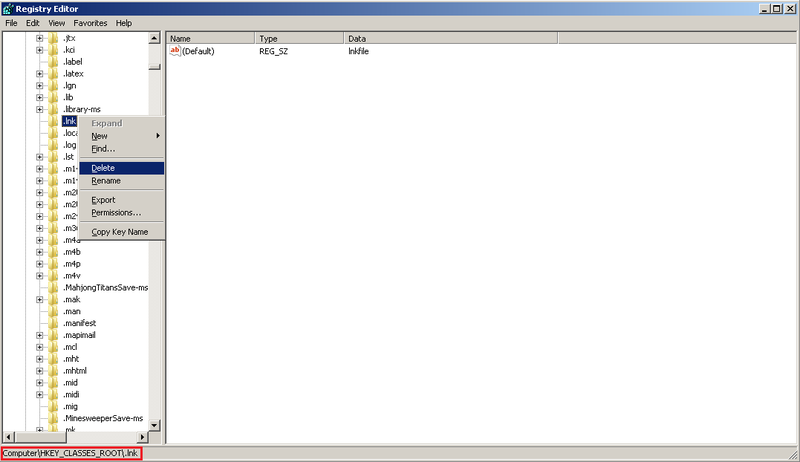 Then associated required extension file to this dummy exe program. then deleted the dummy .exe program file. worked for me. It works for me, thank you very much for this post. Resetting .lnk association worked for me. Thanks! Thanks for this post! I reset successfully .lnk association! It worked! I was just about to give up and write my pc off and then I found this info. Yours is the only fix (of the many other stated ones out there) that worked for me. Thank you so much for posting this info. Thanks a lot ! 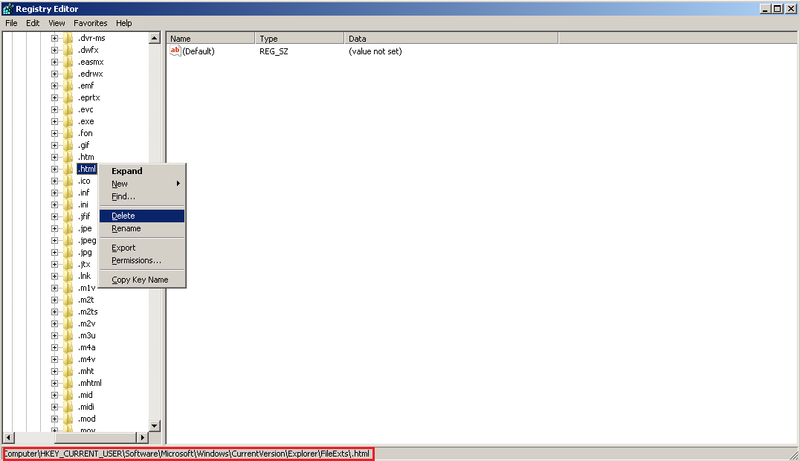 — from the above dates it seems that this is a recent problem..
What do you do if it is not a file that was associated with the .lnk extension but a folder? (after having been infected with the$RECYCLER virus)? 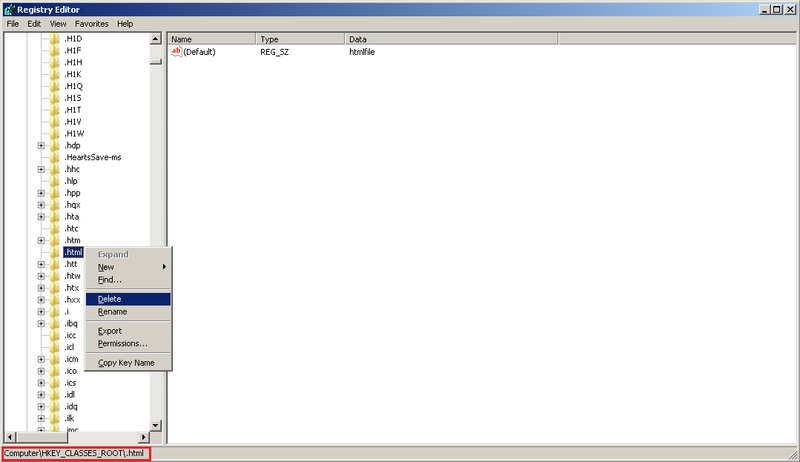 Awesome; restored my .lnk files. Might mention too that instead of going to Accessories for your command prompt (which also is a .lnk and will be therefore confused on how to open) that you navigate to c:\windows\system32 and find CMD.EXE before right-clicking and choosing “run as admin”. thnx. worked for me too. 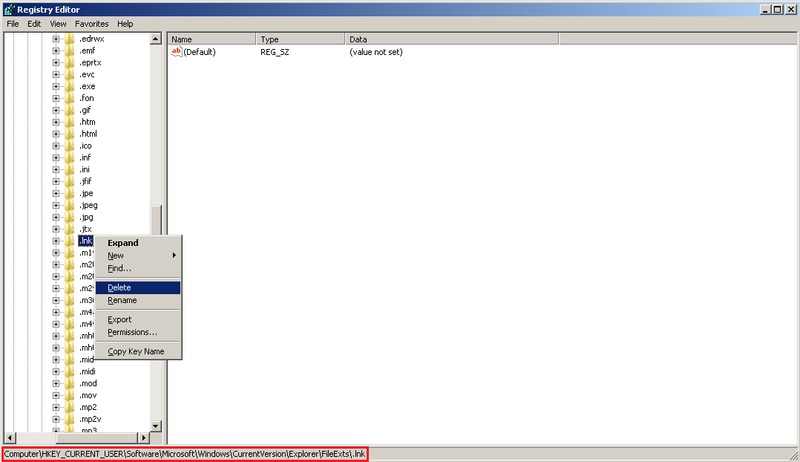 very helpful post..
Found your blog recently while googling for APC.PHP file. I just want to say thanks. I was in the middle of a different mess and accidently made the notepad association to the .lnk files. This helped me get back to the previous problem quickly. Muchas gracias amigo mio. I can’t open command prompt because it too is an .lnk file! 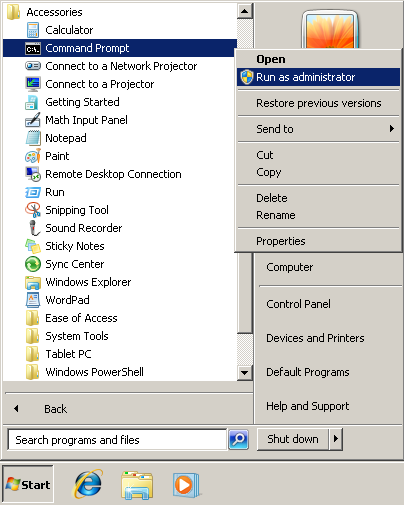 Now search for cmd.exe, right-click and choose Run As Administrator. any idea about this please.? If you are able to open the command line type “regedit” in it. Hi. Thanks for this post. Works like a charm on Win7 PC. Kudos to you. I’ve been trying to solve this puzzle for days…bless your heart, dude…you ARE the “go to” man. 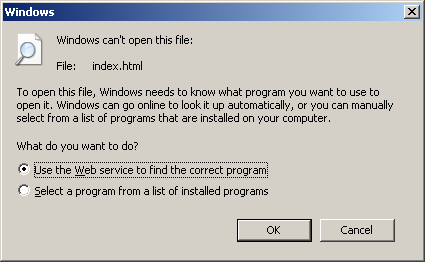 I did have to use the “Press [Windows] + R to open the Run window and enter ‘system32’; now search for cmd.exe, right-click and choose Run As Administrator”. Thanks for adding that info, too. Bottom line…IT WORKED, IT WORKED, IT WORKED!!! That was great solution to very specific issue. I have test it few times and it was perfect and simple. Ok. This looks great. But what if the extension is not .lnk but .exe? Have managed to get into the registry to make changes to associations but need to do the last bit with CMD.exe……which I cant open. Any ideas? Please? Try this – Press [Windows] + R and type system32, from the list of files find and right-click cmd.exe and choose Run As Administrator. Excellent answer! Exactly what I was looking for! I do a lot of onsite work with clients (agriculture software) and there is no internet. Any way I could get a .doc or .pdf of the above article? Thanks a lot. It worked !!!! Worked perfectly when nothing else would. Thank you so much!!! THANK YOU! Found other sites first on trying to get windows 7 .lnk association filetypes corrected and they were all coming up short. Yours worked and was very clear and easy to follow. You explained very clearly and precise. works 100%. Thank you! This worked exactly as documented. In my case, the .lnk were associated with adobe reader. This helped immensely!! Thanks for this clear and detailed post!! I tried for many times watching many many many videos here in Brazil (I watched many Brazilian videos), read tutorials in portuguese too, but I just got nervous, but this simple post solve my life.